South Africas's number one and longest serving vernacular stand-up show is heading to Jozi’s premier entertainment destination, Gold Reef City on Friday, September 30. The comedy extravaganza features headline acts, Siyanda Maphumulo, Felix Hlophe, Sengsay, Tsoro and will be supported by Zimbabwe’s very only professional ventriloquist, Aljoy. 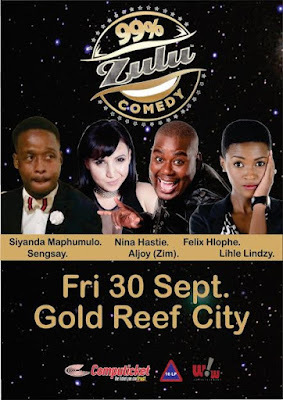 The show will be underlined by two ladies who feature on the 99% Zulu Comedy stage for the first time in Lihle Lindzy Msimang and Nina Hastie. Lihle, winner of the 2011 Nandos Comedy Showdown, is a young female comedian and actress. She has featured in various prestigious stand-up comedy events and DVDs. Attractive, vibrant and energetic, she is a guaranteed laugh out loud and a fine talent in the growing industry in South Africa. She has unique, clean approach, which saw her become a guest feature in Parable Magazine’s Lord, Make Me Laugh. Lihle also holds a Three Year Bachelor of Arts Degree in Performance Arts and Filmmaking, and has appeared in several Television shows; starred and edited Comedy Film/Documentary Triple O the movie which showed at Sterkinekor, starred and presented sketch comedy show Crack it Open on Soweto TV, and presenter of prank and comedy television show Laugh Out Loud on Mzansi Magic, to name just a few. “Expect tears of laughter as this much anticipated comedic group returns to Gold Reef City”, says Monwabisi Grootboom, Show Producer. 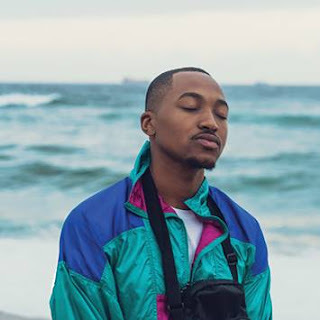 “The Lyric has established itself as an incredibly popular standup comedy venue attracting many of South Africa’s top comedic acts, and we couldn’t have chosen a different venue as our home”. The show starts at 8:00pm and tickets are available from Computicket and tickets range from R180 to R200 per person.